Vail enjoyed the first real powder day of the season on Friday, with parts of the Back Bowls opening up (Vail Resorts photo). Even more Back Bowl terrain will be available starting Saturday. Thanks to more than a half of foot of new snow on Friday and nearly two feet in the last week, Vail cranked up Chairs 5 and 9 in the Back Bowls for first time so far this season, and on Saturday the resort will open parts of China Bowl, Tea Cup Bowl, Sun Down Bowl and Blue Sky Basin. Beaver Creek also will expand its skiable terrain to more than 1,000 acres Saturday after nearly two feet of new snow in the last week, and forecasters are calling for the snow cycle to continue next week. It seems the abnormally slow and dry start to the ski season may finally be giving way to a more typically snowy pattern. 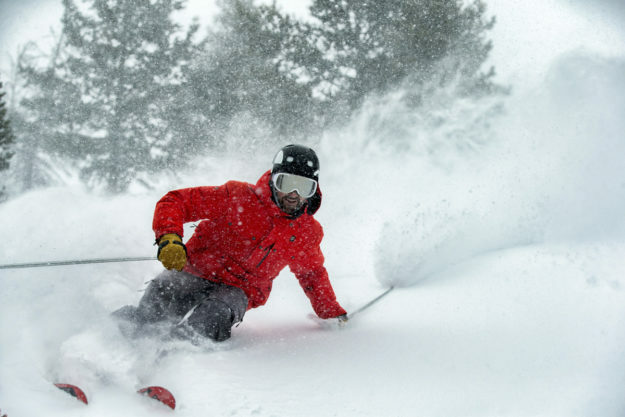 “Snow began to fall in the northern mountains on Thursday at midnight, and as of Friday at 6 am there is already 1-6 inches of accumulation, with another 4-8 inches likely to fall throughout the day on Friday,” Opensnow.com meteorologist Joel Gratz reported Friday morning. VAIL, Colo. – Jan. 12, 2018 –The snow just keeps falling. With 6 inches of snow falling throughout the day on Friday, bringing the seven-day snow total to 21 inches, Vail Mountain will open portions of China Bowl, Tea Cup Bowl and Sun Down Bowl, in addition to portions of terrain in Blue Sky Basin, on Saturday, January 13. Sun Up Bowl is now open for ski and snowboard access. Beaver Creek received 5 inches of snow during the day Friday and 23 inches in the last seven days, and skiers and snowboarders will have access to more than 1,000 acres of skiable terrain on Saturday, January 13. Belle’s Camp will be open on Saturday, January 13 with limited service. Belle’s Camp and The Dawg Haus will open on Sunday, January 14 for regular winter operations. The Nordic Center at Beaver Creek Resort has approximately 80% of its trails groomed and open for cross country and snowshoeing, approximately 15 miles of trails.